Who doesn’t love unicorns? I love them so much so, that I also adore Narwhals too! In my mind, a Narwhal is a sea unicorn. If your kids love unicorns as much as I do, then they’re going to love a gift from Brooklyn Owl. Annie Bruce, and her daughter Bee created these magical unicorn horns, and founded Brooklyn Owl. Every item is made right in Brooklyn New York by Annie, or one of her talented seamstresses. These horns are really adorable, and amazing as well. You can choose from Sparkly horns, or Felt horns, even a Narwhal horn! Brooklyn Owl has baby sizes (mini which are 1.75 inches tall), tween (three and a half inches tall), their original horn size (approximately five inches tall), and giant ones, which are about eight inches tall! Do you have a horse? If so, Brooklyn Owl has unicorn horns for them too! How cool is that? They also have Unicorn Ear Sets (which are two ears and a horn on an elastic headband, and Monster horns (two mini horns hair clips,) too! They even have cat ears too! If they love mermaids, then Brooklyn Owl has hair clips they will love. They have a nice selection of mermaid “scale” hair clips in beautiful colors! Looking for unique party favors or decorations? Brooklyn Owl has a nice selection of felt garlands, cake toppers, and even felt confetti. They have everything you need to make any day just a bit more magical. Brooklyn Owl has something for everyone. Girls, boys and even your kids with fur will love their items. If you don’t believe me, check out my son’s service dog, Bayleigh. 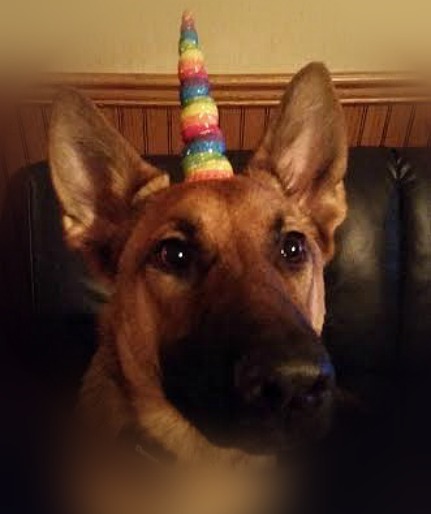 Annie was cool enough to send her the Rainbow Sparkle Original Size Unicorn Horn. I don’t think it gets much cuter than this. She has been wearing that horn for over half an hour. I think it’s safe to say she likes it! I know you want to get some for your kids, and hey, maybe even yourself, so head to Annie’s website. You can also find her on Etsy, Facebook, Twitter, and Instagram. If you’re in the Brooklyn area, check out these fine retailers for Brooklyn Owl.